After 25 years of driving up and down the east coast of Florida between our home in Charleston and friends in Miami and Jupiter, we finally decided to stop for a night in St. Augustine. That was the end of August 2017. Lydia, as usual, researched our one night stay and found an old hotel/B & B on the main drag, across the street from the Intercoastal. I, on the other hand, remained pretty much oblivious until we were actually making our way from 95 into the old city. I’m just not much of a coastal Florida fan, as every road to the coast looks pretty much the same to me – stop lights and strip malls. We lived in the West Palm Beach area for 6 months or so when first coming east from California. But, in my opinion, there’s just no character to the place. Military Trail, US 1, A1A, they all look the same. And so do the roads going to the ocean. I enjoyed the weather, and actually preferred summer – without the snowbirds – over winter. My favorite snowbird incident happened in October of 1992, I think, when the little old New Yorkers, who probably didn’t even own cars in the city, would come back to town in their huge Cadillacs and proceed to make a mockery of every driving norm known to man. One day I was following such a Caddy up Military Trail in Palm Beach Gardens. I could barely see the top of the driver’s head, and he couldn’t have had much eye clearance over his steering wheel. He turned on his right blinker but went straight through the light. No big deal, so I looked in my rearview mirror to see if I could get around him, figuring he was trying to find his turn. Well, find it he did. In the middle of the block with no street, driveway or even pavement-cut in sight, the little old guy turned right. Up over the curb, front wheels on the stubbly grass, his car came to a stop while I watched in the mirror. No movement. He and his wife just sat in the car, both apparently trying to figure out what went wrong. When I saw Lydia later that afternoon I told her it was time to leave Florida. 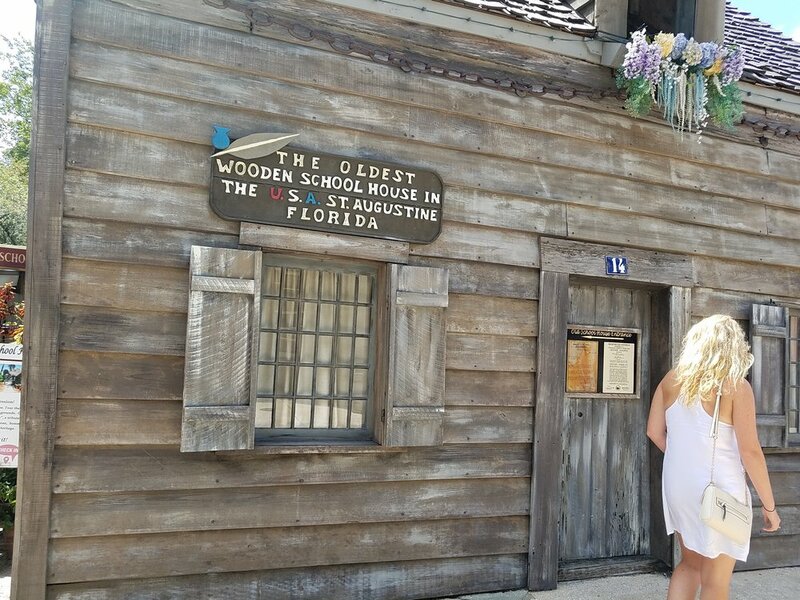 So as we motored toward St. Augustine I couldn’t help but second guess our decision to visit. But at the end of that day I could freely admit I was wrong to doubt. It took a while, though. I can be a bit of a snob. And for someone like me who dislikes Myrtle Beach, Gatlinburg, Daytona Beach and all places that slap you in the face with their tourist schtick, my first impressions driving toward the old city were discouraging. I’m sorry, but Ripley’s Believe It or Not is NOT my idea of American History. A little further down the road was the Pirate Museum with it’s tacky sign, and the wax museum. You get the idea. I’m a Charleston snob. I like my version of history tasteful, and A1A coming into St. Augustine wasn’t it. But then again, try entering Charleston on US 17 from the south. Maybe no amusement parks or put-put courses, but not very attractive. Walking – I love to walk and pretty much everything you’ll want to see in the old city is within walking distance. Trolley – if you get tired or hot or can’t handle too much walking, the little trains on wheels are convenient and affordable. Once you’ve done the whole circuit you’ll know the St. Augustine story, but each driver adds his or her own personality. Again, not as charming as Charleston’s carriages, but also not as odiferous. Public Restrooms – unlike in Charleston, public restroom are clean and numerous. 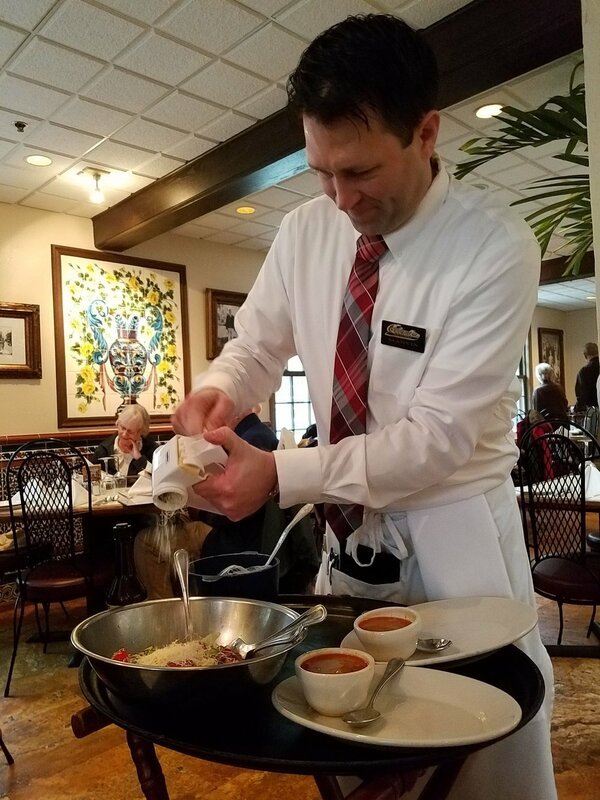 Restaurants and Entertainment – for as small a place as St. Augustine is, there are plenty of good places to eat. Menus vary from burgers and BBQ to good seafood and Spanish traditional. Live music abounds, even in January. Christmas Lights – this is why we went the second time. The city leaves its’ lights up through January. They are quite spectacular so I strongly suggest the night lights tour. I overheard one couple talking about the difference in crowds in December and January. If you can wait until after the holidays, the crowds and the prices recede. 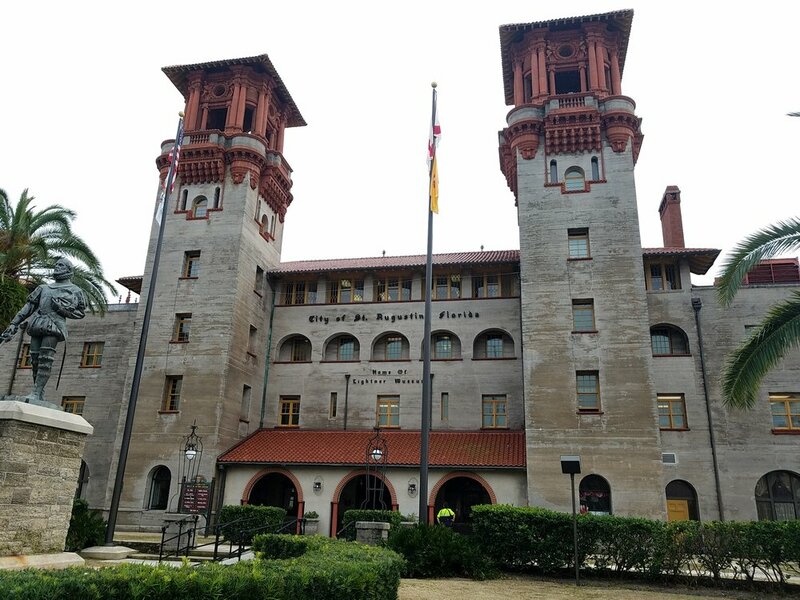 Flagler College/Flagler Museum – you can’t escape the ghost of Henry Flagler. St. Augustine history kind of jumps from the Menendez and Ponce de Leon landings in the 1500s to the Gilded Age – Flagler and his cronies of the 1880s. The Ponce de Leon hotel he built is reminiscent of the Biltmore and The Breakers. The only way to see it, because it’s now a functioning college, is to take the tour. Do it. Lightner Museum – across the street from the college, this old hotel, also built by Flagler, had the world’s largest indoor swimming pool of its time (now a restaurant). Definitely worth a visit. St. Augustine Distillery – the most visited craft distillery in the U.S., they make bourbon, gin, vodka and rum. All are good. I took home their bourbon. St. Augustine Wild Reserve – about a half hour from the old city, this place is incredible. They take in large cats – jaguars, lions, tigers, etc. – from zoos, private collections and from people who shouldn’t have had them in the first place. They also have a bear, hyenas, small wild cats, wolves and coyotes. The geese and buzzards accompany you on the one tour a day. Make reservations in advance. 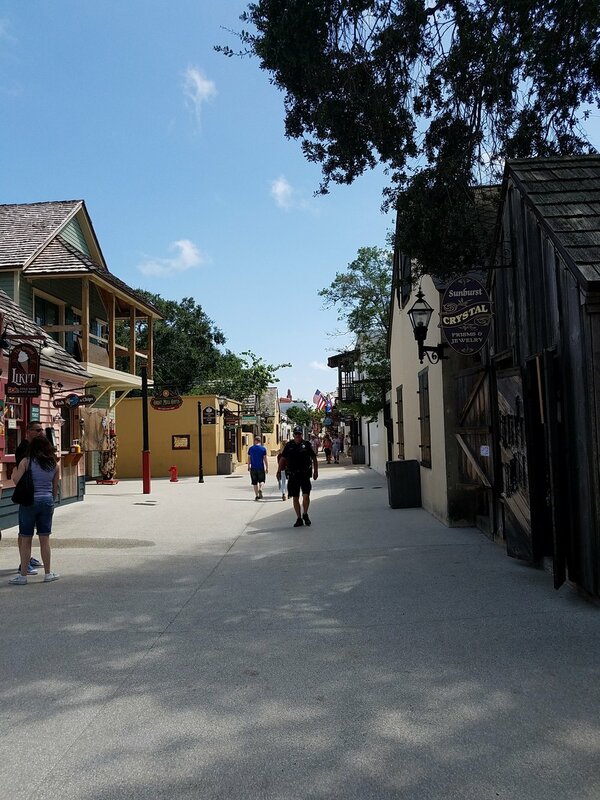 History – from the Fort to the Old City, St. Augustine has plenty of history, and, for the most part, it’s history that won’t be overly familiar. Of course, we know that St. Augustine was the first colonial settlement, but that’s really about the extent of what we learn in school. St. Augustine is really worth your time, but I suggest a fall or winter visit, if you can. I hear it can very crowded, especially in the spring and during the holidays.